Vara valla Tammevaldma talu upub bürokraatiasse ja veidratesse nõuetesse. Noortalunik Vallot Kaasik (vasakul) ja tema vend Fredi kaaluvad poolesaja lihaveise müümist. Next to the field one detects these steaming freshly pressed rolls of smouldering, smelling and mouldy matter. Just some few years ago, farmers were spared the toil of scraping off hay spoiled by rain on the fields. Now, that's the rules. The toil was the lot of Vallot Kaasik (32), had of Tammevaldma Farm in Vara Parish. He had no option, under orders from Estonian Agricultural Registers and Information Board (ARIB). 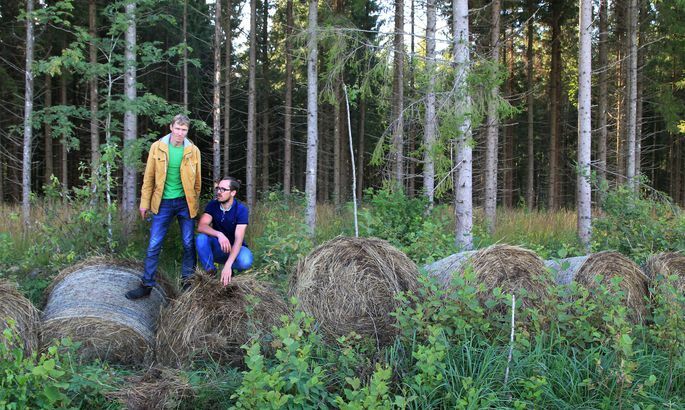 Mr Kaasik calls this Hay of Urmas – Urmas Kruuse being Estonia’s hugely unpopular rural life minister. Hay of Urmas may burst into flame any minute. But, at least, the rules and requirements have been officially satisfied. It cost him some €1,000 to scrape it off and press together, from his 15 hectares. 120 rolls are the result, 700–800 kilograms each. They say the same sight is seen elsewhere in Tartu County as the hay was mown in July but was spoilt because of the rain. It used to be easy with hay spoiled by bad weather, it being enough to «pulverise» it by a device dragged by a tractor. Thereby, area-related aid from ARIB was guaranteed. Now, only up to ten percent may be treated that way, the rest needs to be rolled into rolls. Or else, one must grow grain. At that, the deadline was August 10th thus the farm was busy as a bee. Only after the date, ARIB announced that they were willing to grant extra time according to the weather map. The agency admits to be groaning under rules set by Brussels. As for all the above, hectares and percentages are difficult to prove in real life. Lagging behind with checks, ARIB does not exclude postponement of paying the overall area-related aid. «Theoretically this can happen,» said a representative. -Rural life minister Urmas Kruuse, why do the small farmers have to thus waste their time? This is a single case, I guess. We wish that valuable agricultural land be in agricultural use. Bringing down the percentage of those who [merely keep it and] just mow the grass occasionally. -In the given instance, professional cattle breeding farmers are suffering. Why create such problems? You are talking about the weather right now, which nobody can precisely foretell. In such cases, individual approach is needed. Not true that aid will automatically be withdrawn if they manage not by deadline. I cannot tell why the talk changed. For me it has always been a matter of principle that punishing cannot be our first step. ARIB can look at the rainfall map, we do have counties where part of the county is totally dry and part is totally wet.